​Chelsea, Manchester City and Manchester United were among the winners in the Women's FA Cup fifth round on Sunday as the final 16 teams were whittled down to just eight. 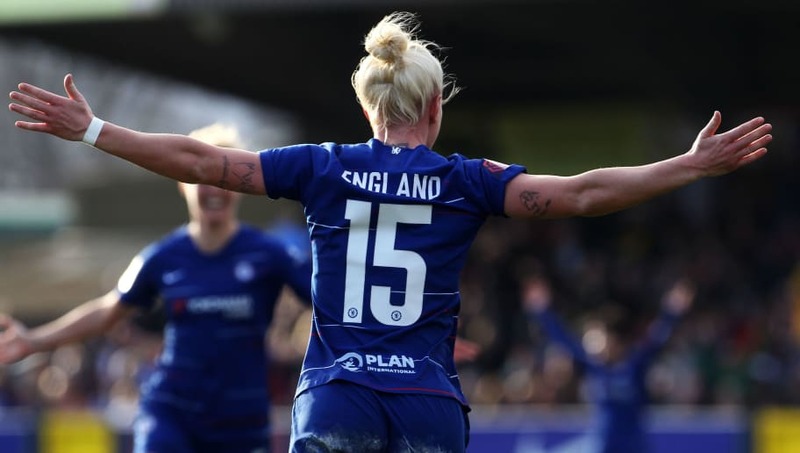 Despite a recent stumble in the Women's Super League title race, cup holders Chelsea made a statement with their 3-0 victory over rivals Arsenal. Striker Bethany England scored twice either side of a drive from Swedish defender Jonna Andersson, with no response from the Gunners. Manchester City, who are top of the WSL standings ahead of Arsenal - albeit having played two games more, saw off second tier Tottenham 3-0. Two goals in quick succession towards the end of the first half from captain Steph Houghton and Lauren Hemp ultimately made the difference for City, with Gemma Bonner making it a comfortable win soon after the interval. On course for immediate promotion to the top flight WSL and narrowly beaten in the Continental Cup semi finals, Manchester United continued to thrive in their debut season, seeing off fellow Championship club London Bees with little trouble. Much like City's win, the damage was done in the space of only a few first half minutes when Ella Toone and Mollie Green struck in quick succession. Charlie Devlin chipped in with the third, literally, in the final few minutes to make it 3-0. Elsewhere, there was a 2-0 win for Liverpool over second tier Millwall - Kirsty Linnett and Rinsola Babajide the difference makers for the Reds. Reading beat Birmingham 2-1 in an all-WSL affair, while second tier Durham shocked top flight Bristol City with a 2-0 win. After three goals apiece, Championship pair Aston Villa and Sheffield United could only be separated in a penalty shootout – won 5-3 by the former. Villa's 18-year-old starlet Jodie Hutton bagged a hat-trick during the game and converted the winning spot kick. VILLA HAVE DONE IT!!!!!!!!! @jodie_hutton is the hero as she sends Villa into the @SSEWomensFACup quarter finals!!! West Ham were the biggest winners on the day, putting eight goals past third tier Huddersfield, the lowest ranked team left in the competition. The gulf in class was not apparent from the off, with Huddersfield actually taking the lead before an immense response. The Hammers went on to score four times in each half, with Leanne Kiernan the star of the show after netting a hat-trick on her return to action after injury. Chelsea, Manchester City, Manchester United, Liverpool, Reading, Durham, Aston Villa and West Ham now await their quarter final opponents ahead of Monday evening's draw. Quarter final ties will be played on Sunday 17th March.